It’s never been easier to make a fresh and fabulous meal at home! Check out our scrumptious recipes, handy how-to’s and a whole lot more. Your friends and family will request these spectacularly easy dishes time and again. Learn how to get the most out of that gorgeous cut of pork you just bought. What’s that cut? And what’s the best way prepare it? Learn here! Get the skinny on this tasty protein. A simple yet elegant meal in just a few steps. Salt, pepper, oil and a frying pan are all you need for perfect chops. Meet your new favorite pressure cooker meal! To check doneness, use a digital cooking thermometer in the thickest part of the cut without touching any bone. Once the temp reaches 145°F, remove pork from heat and allow to rest. With so many cuts of pork to choose from, which is the right cooking method for each? Check out this easy cheat sheet! Don't cook pork straight from the fridge! Take your meat out 15 minutes or so before you plan to start cooking to allow it to come up to room temperature. Marinate your pork for at least 30 minutes before cooking to infuse with more flavor. 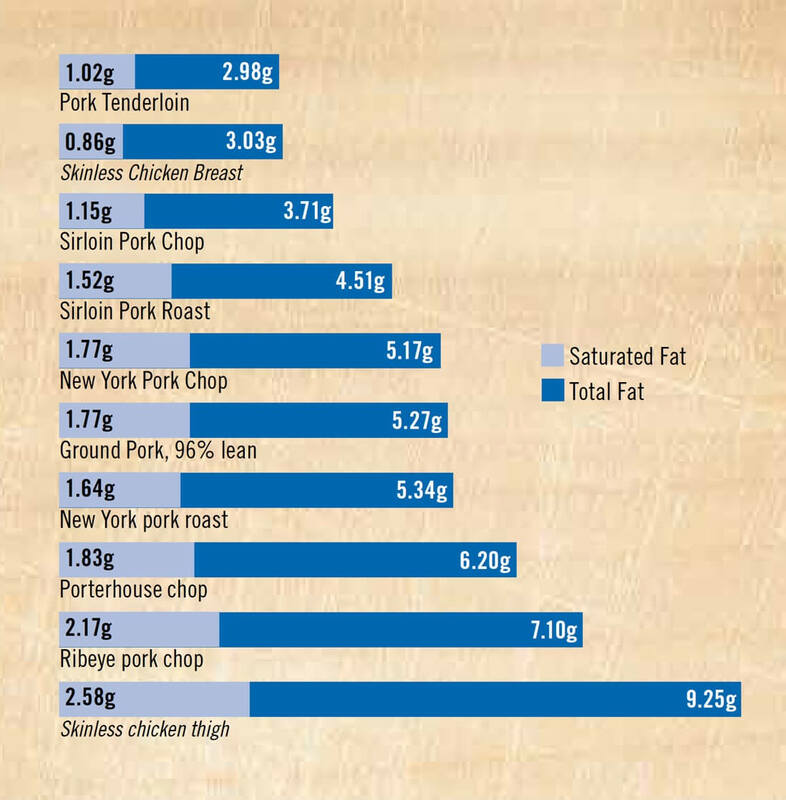 The general guideline is about 1/2 cup of marinade for every pound of pork. For best results, use an instant-read thermometer. Pork steaks, chops and loin should be cooked to a minimum internal temperature of 145°F, with a three-minute rest. Check out the full list of cooking times and temperatures, based on cut and cooking method. If you're looking for some hearty AND healthy options for dinnertime, pork is the perfect go-to! But what qualifies as ‘lean'? USDA guidelines state that lean meat must contains less than 10 grams of total fat, with no more than 4.5 grams of saturated fat. This means there are 8 cuts of pork that are considered lean, and pork tenderloin is EXTRA-lean, with less than 4 grams of total fat- comparable to skinless chicken breast! Based on 3-oz. cooked servings (roasted or broiled), visible fat and skin trimmed after cooking. Reference: U.S. Department of Agriculture, Agriculture Research Service, 2012. Lean: Less than 10g total fat, 4.5g saturated fat and 95mg cholesterol per serving. Extra Lean: Less than 5g total fat, 2g saturated fat and 95mg cholesterol per serving. A simple yet elegant meal is just a few steps away. Just follow these easy steps and get set to receive all the compliments for your perfect pork loin roast! A juicy, flavorful pork chop is just a few minutes away from the table when cooked on the stove top. Follow these easy steps to achieve porktacular success. What used to take most of the day to make can now be on the dinner table in about an hour. Try this all-American favorite done the pressure cooker way. Copyright © 2018  All Rights Reserved  Freeosk, Inc.